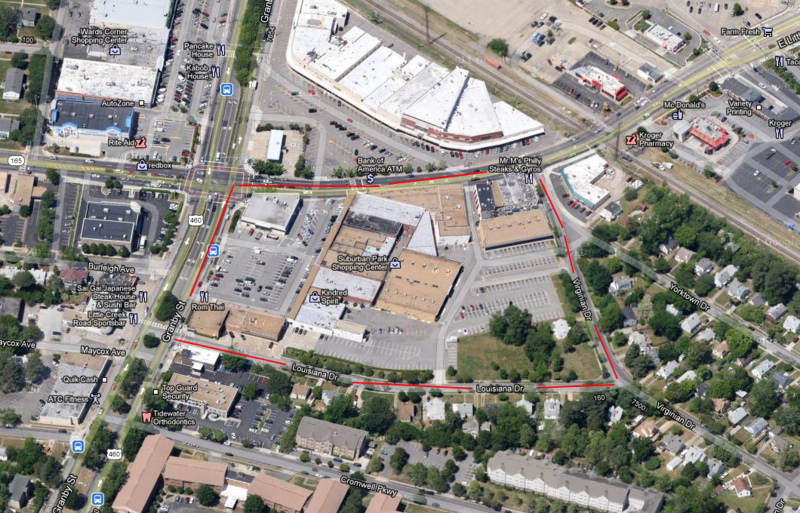 The new shopping center will replace the entire block, marked in red. Chris Perry, on behalf of Suburban Land Management, attended the Wards Corner Taskforce meeting this morning. Suburban Land Management now owns the entire block bounded by Granby St on the West, E. Little Creek Road on the North, Virginian Drive on the East, and Louisiana Drive on the South. Mr. Perry and his partners, who attended the meeting, provided an approximate timeline for the demolition and construction of the new shopping center. Harris Teeter is expected to be the new anchor. According to the Virginian-Pilot, Harris Teeter has agreed in principle to build a 53,000-square foot outlet and the entire investment on behalf of Harris Teeter and Suburban Land Management will be $18 million. The plan is for Mr. Perry to attend civic and community meetings in February and go before the Planning Commission and City Council and March and April, respectively. The project must go before the Planning Commission and Council because a number of properties that will be included in the new development need to be rezoned. Demolition is expected to begin in the summer of 2012 and Mr. Perry is hopeful that the new shopping center will open in 2014. Wards Corner Now will be posting a schedule of civic and community meetings in the near future where Mr. Perry and Suburban Land Management are expected to reveal initial designs of the new development. This entry was posted on Thursday, January 12th, 2012 at 7:41 pm and is filed under economic development. You can follow any responses to this entry through the RSS 2.0 feed. Both comments and pings are currently closed. Very happy and excited for this to be happening!